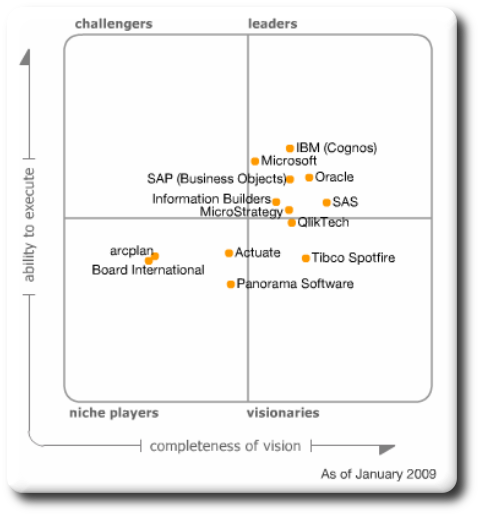 The most interesting fact in Gartner’s analysis is that QlikTech/QlikView is not a visionary anymore! THERE ARE NO VISIONAIRIES ANYMORE!! Even Qlikview isn’t a visionary anymore. 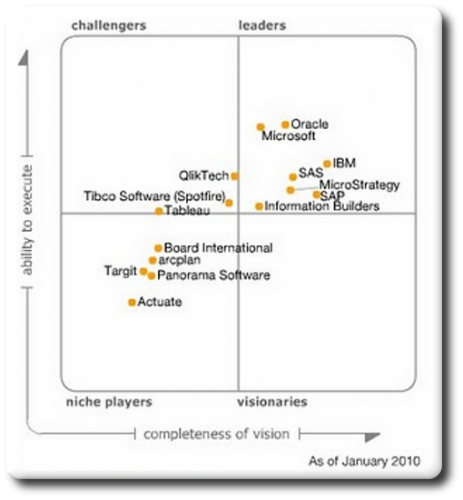 … the explanation for Qlikview not being part of the visionaries anymore is quite understandable. Other parties are copying the unique selling points of Qlikview. Microsoft introduces PowerPivot, SAP created an easy entry proposition with Business Objects Explorer, and Cognos came with Express, all focusing at business users, some of them with in-memory techniques, enabling business users to what Gartner calls “Surf and Safe”. That “proves” that Qlikview is on the right track with the big vendors copying Qlikview’s approach. One major issue that Gartner is pointing out in its analysis is that Qlikview could have had its momentum. Qlikview is/has been very successful with in-memory technology and 64-bit computing enabling scalability of Qlikviews model. To summarize what Gartner says about Qlikview’s strengths, we can be very short: It is easier, simpler, cheaper, faster, quicker to deploy and is more feature rich than the competition. To conclude this post: Qlikview is still going strong and has a very good product (and marketing), but Qlikview needs to show some vision on the short and medium term. Vision is not about incrementally adding new functionality, but more about how to service those large enterprise deployments. Qlikview has to do some serious work on an enterprise wide semantic data layer and better tools to manage large deployments. and tagged Gartner, Market Analysis. Bookmark the permalink. Both comments and trackbacks are currently closed.